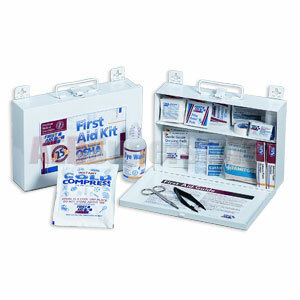 This 106-piece first aid kit is ideal for contractors, fleet vehicles, worksites or small companies with up to 25 employees. It meets federal OSHA recommendations and carries 17 critical products including a 4 oz. eye wash. The strong metal case is wall mountable yet has a handle for easy carrying.